The Joyetech Unimax 25 is an all in one (AIO) device that has a built in 3000mAh. The straight shape of the device gives the user a refreshing change from the standard box shaped mods. 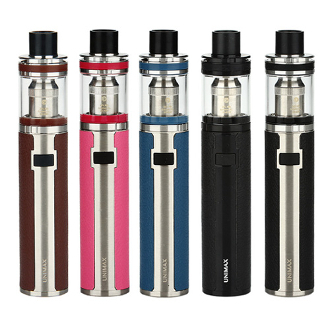 It has a simple one button design and features and direct and constant voltage output that pairs great with the Unimax 25 tank. The Tank has the "TFTA" which is a top fill and top airflow design. The large air holes allow for an increased vapor production and easy inflow when inhaling. The kit comes with 0.5 Ohmed coils and are specialized for direct lung Vapers for maximum clouds! Atomizer Head Replacement: Unscrew the upper component, you'll find the atomizer head attached on the vent pipe. Remove the coil head to replace or clean. Note: Please do not wash the atomizer head with water. Simply scrub it with cotton or clean dry cloth. Filling Instructions: The Joyetech exclusive TFTA (top-filing and top-airflow) technology was perfectly applied into the UNIMAX 25 atomizer. into the side holes from the top.